A test flight of the fifth generation Su-57 fighter jet with a developmental engine installed on it has been caught on camera in Russia's Zhukovsky. The Sukhoi Su-57 stealth air superiority fighter, also known as flying laboratory T-50-2, is one of the sleekest and most modern aircraft of the Russian Air Force. It made its debut at the Victory Day Parade on May 9 on Moscow's Red Square. The first test flight of the Sukhoi-57 took place at Zhukovsky airport on December 5, 2017. Flight tests were later resumed in February, 2018. Packed with state-of-the-art avionics and active airborne phased array radar, this super-maneuverable fifth-generation warplane can carry a wide array of weaponry, allowing it to engage airborne, ground and naval targets. The Su-57, also known as the PAK FA, is a multi-role fifth-generation fighter jet which was developed for air superiority and attack operations. 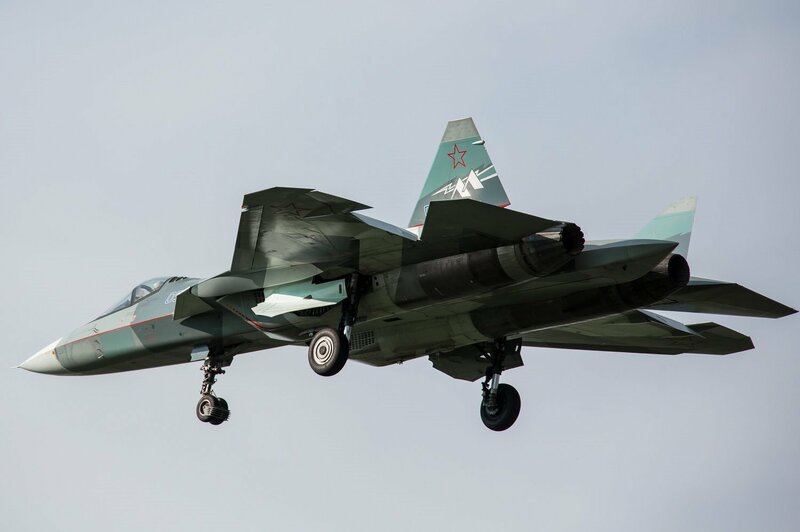 Some of the most impressive aspects of the airplane include the fact that it has side-mounted active electronically scanned array X-band radars, which enhance the Su-57 fighter's situational awareness. It also allows the plane to execute specialized aerial maneuvers such as ”beaming” better than nearly all other fighters. The Su-57 has turrets that fire laser beams at an incoming missile's seeker to blind it and throw it off course. The Su-57’s internal weapons can hold between four and six medium-range air-to-air missiles, or even a smaller number of larger-payload guided bombs.